The following is an excerpt from Silent City on a Hill: Picturesque Landscapes of Memory and Boston’s Mount Auburn Cemetery by Blanche M. G. Linden. To maximize the use of all parts of the grounds and to accommodate the taste for entombment, the trustees voted in 1856 to permit tombs in hillsides, provided all but the door and granite façade were underground. 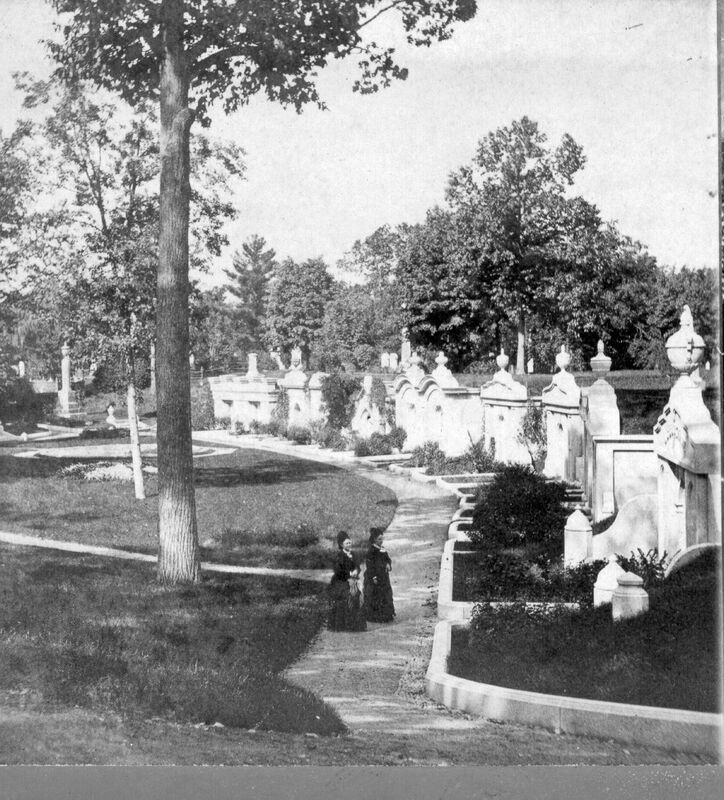 On a fact-finding trip to major eastern “rural” cemeteries in 1857 superintendent Jonathan Mann inspected the structures of tombs and freestanding mausoleums, many more expensive and ornamental than those at Mount Auburn. Mann found that Brooklyn’s Green-Wood , Philadephia’s Laurel Hill, and Baltimore’s Green Mount permitted aboveground stone structures as long as bodies were placed in pigeonholes sealed with brick, stone or cement. The trustees resolved to grant permits for such “catacombs,” provided they be airtight and passed inspection, after the proprietor paid a $50 premium for the privilege. 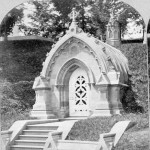 The architect Hammatt Billings (1816 – 1874) designed the neo-Gothic tomb of Jersey stone for Joseph Whall in 1858. 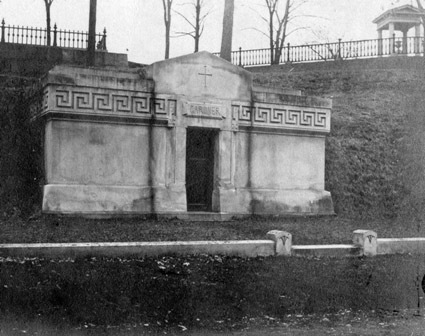 The nearly freestanding structure with a barreled-vaulted roof backed into the hillside on Lawn Avenue behind the chapel contained eighteen niches into which caskets could be hermetically sealed, preventing the release of “noxious gases.” That year the trustees seized the opportunity to sell lots on “incorrectably” steep hillsides at fifty cents per square foot for catacomb tombs and developed some tougher terrains themselves. They charged Mann to contract in 1859 for the building of two granite-fronted catacomb tombs as models in the Indian Ridge hillside in Hazel Dell, the deep hollow just east of Central Avenue, no longer with wetlands in the middle. When they sold immediately, the trustees lined the dell with a semicircle of them, twelve over the decade, though construction was slowed by the Civil War, and built others to sell on Palm Avenue in 1872. Lodge Mausoleum, 1947. Photo by Haskell. Whall Tomb, overlooking the Lawn. Stereograph, 1890. 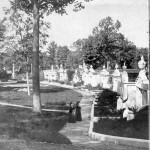 Hazel Dell tombs. Stereograph, 1865. A few proprietors hired architects to design such catacomb tombs. 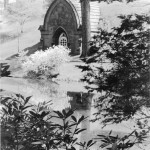 Shephard S. Woodcock may have designed the simple neo-Gothic brownstone tomb for the Lodge family overlooking Auburn Lake in 1866, similar to but less complex than the Whall tomb. 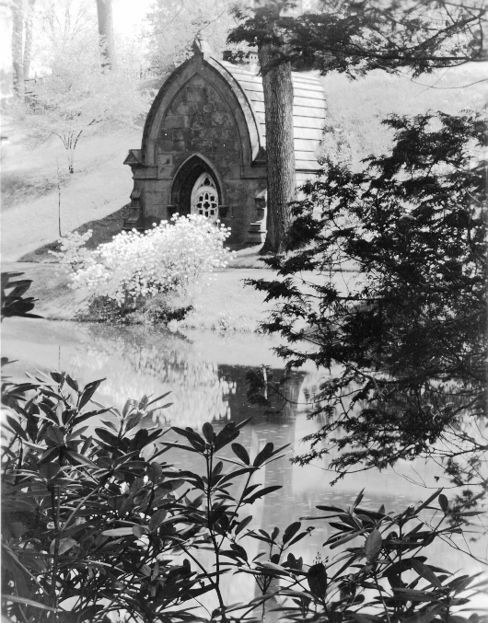 John Lowell Gardner II, father-in-law of the famed doyenne of Boston art, Isabella Stewart Gardner, commissioned a tomb next to the Lodge structure. Completed in 1868, it received three of the family who had died earlier, including Isabella’s beloved son Jackie, whose body had lain in New York’s Green-Wood Cemetery since his death in 1865. 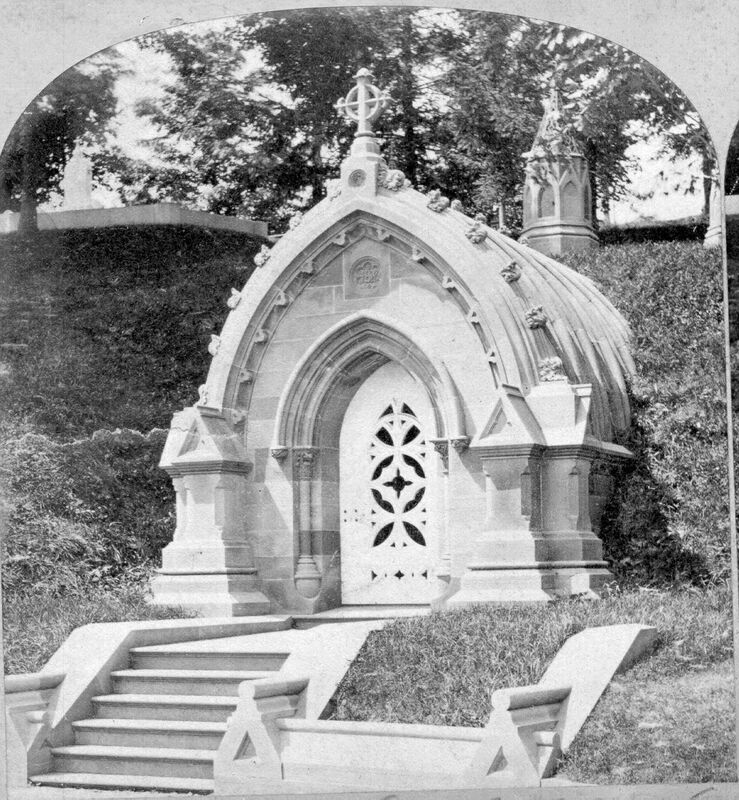 The architect Henry Van Brunt (1832 – 1903) designed Mount Auburn’s first free-standing mausoleum in the 1870s for the Charles W. Freeland family. The Hon. 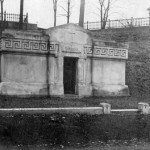 Charles Wells (1786-1866), Boston mayor from 1832-34, lies buried in the Wells tomb, Lot 3120, Willow Avenue, one of these partial underground tombs in your article. A bricklayer and builder, he constructed 89 underground tombs at Copp’s Hill Burying Ground in Boston’s North End. He served as councilman in Boston’s first council after Boston became a city, then alderman and finally mayor of Boston. Later he was representative and senator in the MA Legislature. He was the 6th president of the MA Charitable Mechanics Assn, serving on the Committee of Relief and Board of Governors. For 30 years, he was president of MA Mutual Fire and Marine Insurance Co., forerunner of today’s MA Mutual Insurance. Although Charles’s name and that of his brother John B. Wells is on Tomb 18, Copp’s Hill, both chose to be buried at Mt. Auburn because Copp’s Hill was in one of Boston’s worst slums by the time they died. The tomb of his nephew John Milton Wells in Silverbrook Cemetery, Niles, MI, is exactly like the underground tombs Charles built in Boston. Thank you for this fascinating information Mr. Wells!